The trend is changing as retailers, shopping centers and malls are looking for new and catchy ways to remake themselves to attract new consumer. Initially the departmental stores were the anchors for the malls and shopping centers that used to attract and drew people to malls. But now due to digitalization online buying options has grown easily and faster. So retailers are cutting mall operations and implementing in new business in hope that consumers will find it more attracting. The one stop destination that takes care of everything is mall. Rapid grow in technology and social media has changed expenditure and consumption that has impacted shopping centers and mall a lot. Mall cannot operate in isolation and cannot be successful for shopping only. Wi-fi is an important necessity in mall. 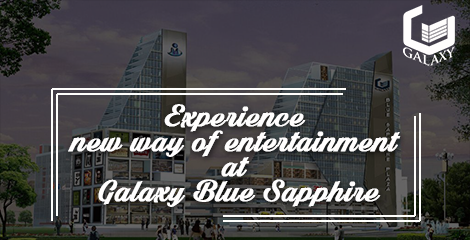 Galaxy Blue Sapphire has come up with shopping hub with all the international amenities and shopping experience. • User-friendly touch screens are installed at information desk. This gives information and helps us to locate various stores, gaming stations, restaurants and all information about the mall. For example “You Touch” recognizes the face and gives us all the information about all our past purchases. • Shoppers can make best use of their time while doing shopping with aquarium, art gallery, skiing and bowling lounges. • Mall app in order to connect with our shoppers and keeping them updated with ongoing and forthcoming discounts, promotions and events. • Community space is available to for hosting any celebration. We have worked on the increasing entertainment options like adding hybrid bowling-based entertainment centers and amusement park. It has multiplex consists of 12 screen multiplex which offers a range of options for movies in a single venue or area of a mall. More and more food and lots of entertainment for all age group is our mantra.